Known by some as the "Boss of the Boogie", pianoman/vocalist ROB RIO plays the boogie-woogie and jump blues of the 40's and 50's with a virtuosity and elan that has excited audiences around the world for more than 30 years. RIO has appeared with many of the original blues greats, such as Muddy Waters, Willie Dixon, James Cotton, Charles Brown, Joe Cocker,Paul Butterfield and many more, and has recorded with Mick Jagger, Canned Heat, Billy Boy Arnold, William Clarke, Coco Montoya,Finas Tasby, Walter Trout, Mud Moganfield, Phillip Walker, Jody Williams, among others, and continues to do session work. Born and raised in the Bronx, N.Y., RIO now resides in Los Angeles and currently performs at festivals, events and clubs at home and on the road and has been a favorite attraction throughout the Southland for the last 25 years, either as a solo performer or with his 5-piece band, THE REVOLVERS. RIO lists several commercial credits along with 15 CDs and DVDs under his own name. Boogie Woogie and piano aficionados will appreciate this collection of 13 solo piano instrumentals by boogie woogie piano virtuoso Rob Rio. Rio shines throughout, interpreting Jelly Roll Morton with FICKLE JELLY JAM, Herschel Thomas with NEW SUITCASE BOOGIE, and ending with a nice cover of Floyd Cramer's LAST DATE. In between are 10 other hot Rio originals. 13 cuts, 39 minutes. 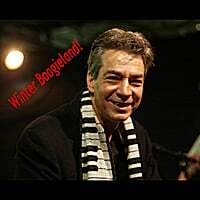 If you’re finding you haven’t gotten into the holiday spirit yet, then the fantastic Christmas Boogie-Woogie/Blues CD, “Winter Boogieland,” by the extremely talented piano man Rob Rio, is just the right thing to set the mood. Rio, who has performed with many well known artists, takes these traditional Christmas tunes and interprets them with a brilliant style and finesse. Opening up the album, “Rudolph’s Red Nose Boogie,” is wonderful as Rio rips across the keys with a fury of energetic stylish flair. Taking it down a few notches, the songs, “Drummer Boy Blues” and “Silent Night Blues,” are not only soulful and rooted with exquisite Blues tonality but one can feel the emotive passion rising from Rio’s performance of these songs. There is a tremendous amount of energy packed into this album and you will find these songs to be fun, vibrant, and brilliantly performed by Rio. Fans of the great Jerry Lee Lewis will truly appreciate the magnificent Christmas Boogie-Woogie/Blues songs on the album, “Winter Boogieland,” as it is an excellent collection of Holiday music performed by a spectacular pianist.